Aert van der Neer – Los Angeles County Museum of Art. Title: Frozen River with a Footbridge. Date: c. 1643-1664. Materials: oil on wood. Dimensions: 58.4 x 68.6 cm. Source: http://collections.lacma.org/node/209222. I have changed the light and contrast of the original photo. Materials: oil on panel. Dimensions: 48.3 x 89.7 cm. Inscriptions: AV DNeer (centre right). Sold by Christie’s in London, on December 8, 2009. 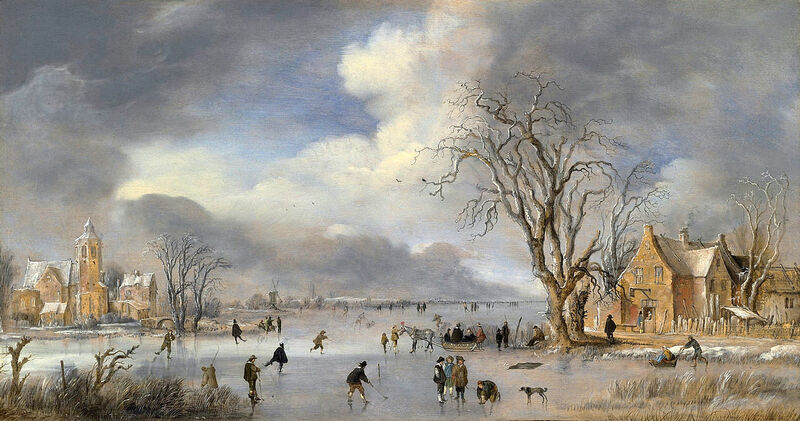 Source: http://nl.wikipedia.org/wiki/Bestand:Aert_van_der_Neer_-_Winterlandschap_met_schaatsers_en_kolfspelers_ca_1642.jpg. I have changed the contrast of the original photo. Aert van der Neer – Rijksmuseum SK-A-3329. 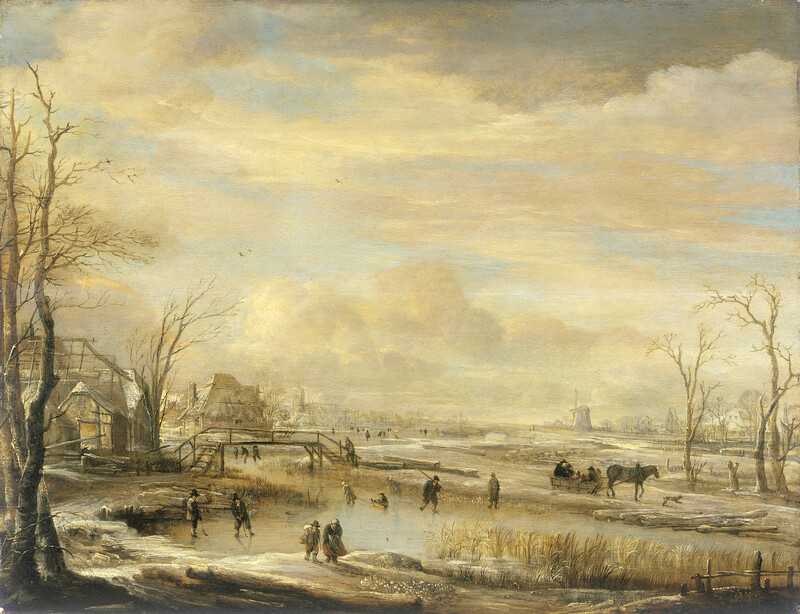 Title: Dorp aan een bevroren vaart bij een sneeuwbui. Date: 1630-1677. Materials: oil on panel. Dimensions: 41.5 x 53.5 cm. Inscriptions: signatuur: AV DN; initialen in monogram. Nr. : SK-A-3329. Source: http://www.rijksmuseum.nl/assetimage2.jsp?id=SK-A-3329. P.S. I have changed the light, contrast and colors of the original photo. The sun appears to be setting beyond a river and its last rays are reflected on the figures and cattle in the foreground. 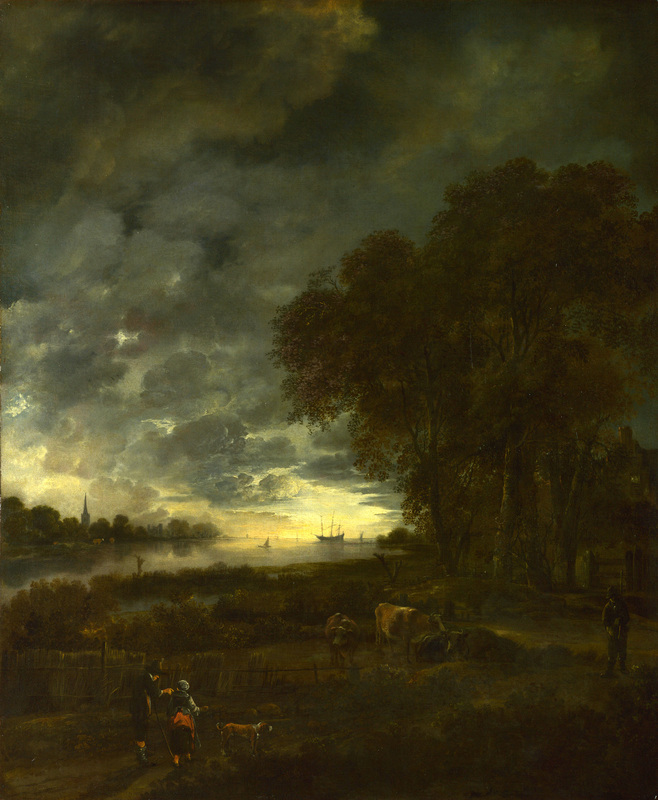 The painting was probably executed in the late 1640s or early 1650s (http://www.nationalgallery.org.uk/paintings/aert-van-der-neer-a-landscape-with-a-river-at-evening).